Apartment with panoramic terrace and garden..... relaxing resort, perfect for your family holidays in summer and in winter!! Amongst the positive comments received from satisfied guests (these can be seen on request), two in particular come to notice where the guests state that this property "far exceeded all their expectations". Understandable enthusiasm when one takes into account that the vast, panoramic apartment which we propose to you is on the upper floor of an antique villa set right in the heart of an immense citrus grove covering 15,000sq. mt. Nature at is best. It almost seems as if silence and sun are welded together to provide idyllic days for our guests who, without having to leave the grounds, can, if they wish, procure genuine local products from the person who looks after the grounds. The apartment, with independent access, has an ample panoramic terrace with deck chairs, sun beds and sun shades. Nearest shops, bank and restaurants at 500 metres. The sea at about 1,5 Km, Sorrento at 4 Km and Positano at 9 Km. On arrival/departure day the owner will place his own car at guest disposal to carry the luggage from the car parking to the accommodation. Access to the property is by means of a narrow lane about 2 metres wide and about 250 meters in length. Large cars can be parked 500 meters away in a private car parking (space for more cars). The apartment of 240 sq. metres is on two levels with antique furnishings is composed of: second level: entrance hall, equipped kitchen, 2 large panoramic double bedrooms, another double bedroom and a twin bedroom, large bathroom with small bath tub plus shower cabin and washing machine, another bathroom with shower and finally ample terrace of 60 sq. mt. with view over the Bay of Naples, equipped with table and chairs for dining al fresco and sunbeds. At first level: another wide kitchen with electric oven, pizza oven, fridge and freezer. Living room with fireplace, table for 12 people, double bed settee and a third bathroom with shower. Another terrace with table and chairs for dining al fresco. Dogs are welcome since the surrounding grounds are extensive and the owner also has a closed dog kennel. Sleeps 8; with bed settee 10. 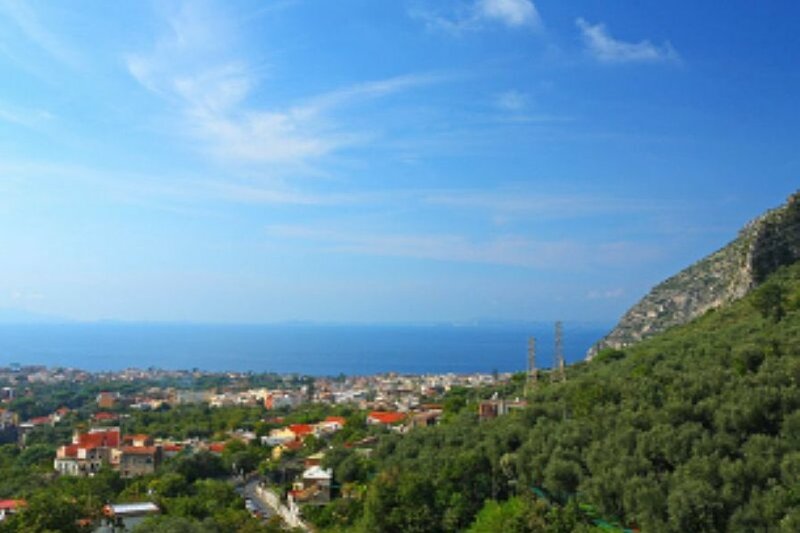 Only 4 Km away there is the splendid town of Sorrento where you will find many shops, restaurants, bars, discos and the theatre where you can see the Tarantella Show. 5 minutes walk away from Tasso Square, the main square in Sorrento, is the train station should you like a trip to Pompeii, Herculaneum and Vesuvius. And more conveniently, about 300 metres from Tasso square you will find the hydrofoil port to enable you to take trips to the Island of Capri, Ischia, Procida and Naples. Services included in the price: water, electricity, gas, fridge, oven, freezer, washing machine, cot, colour TV, dog kennel and car parking. Services not included in the price: weekly cleaning and change of linen Euro 100,00. Heating (payment in resort according to consumption at Euro 0,30 per kw). You can purchase products of the property such as olive oil, wine, eggs and fruit.